MAASTRICHT, March 16th 2017 – Ethnographers have been experimenting with their methods since the 1980s, which is when anthropologists began to question how the process and medium of writing doesn’t describe research results but rather shapes them. Between then and now this question has expanded beyond writing to include other methods of data generation, documentation, and representation – such as collaborative ethnographies and the use of audio-visual recordings. In the context of a larger comparative ethnographic study about how doctors learn sensory skills of diagnosis, an important part of the “Making Clinical Sense” project entails experimenting with collaborative sensory ethnography. Sensory ethnography is becoming an increasingly popular method for exploring taken-for-granted practices that are otherwise difficult to articulate. Sensory ethnographers are often asked to attune to their own learning, to learn with, not about, others. Much of the discussion, however, is focused on the solo researcher, and there is limited attention given to collaborative studies of the sensory. In a quasi- “proof of concept study”, our team – Rachel Allison, Anna Harris, and Andrea Wojcik – sets out to experiment with different digital methods of elicitation and notation which imaginatively attend to sensory learning – namely drawing, photography, and video – while taking another example of a sensory skill that demands finely tuned technique – making omelettes. Because our interest in the medical world is the role of pedagogical technologies, we will document others learning through the use of different technological arrangements: video (Julia Child’s The French Chef); written recipe (M.F.K Fisher’s How to Cook a Wolf); and apprenticeship (under the guidance of a chef). In doing so, we mimic the arrangements we expect to encounter in our individual fieldsites. Working from these arrangements also enables us to cross disciplinary boundaries and collaborate with media and art historians to understand more about what it means to experimentally re-enact and reconstruct recipes. To recap, our starting point is the awareness that our methods don’t describe practices but rather help create them. 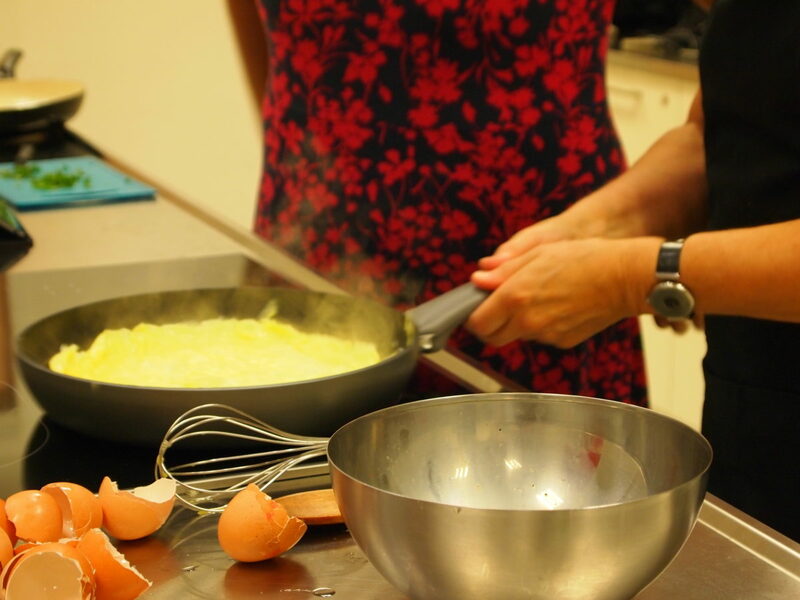 Through ethnographic experimentation, we look for insights from other disciplines – such as media and art history – to be able to understand how we can create practices which inform us about difficult to articulate sensory experiences of learning to cook an omelette. This experiment should help us direct our use of audio-visual methods as a collaborative team studying doctors’ learning of sensory skills across three fieldsites. We look forward to conducting this experiment in the summer 2017, and will report back on our experiences later in the year.